That said, please allow me to expand on my love of Hamilton (not so briefly touched on in my previous post). But in order to keep things manageable, let’s focus on the other Hamilton: Eliza (née Schuyler). Now, know that I’m no historian. I minored in American Studies and had to read a whole bunch of the Federalist Papers, but that’s about as far as my knowledge of Hamiltonia goes – or I should say, went, as since my obsession with this musical, I’ve done a whole bunch of Wikipedia-ing. Still, this discussion of Eliza Hamilton does not aim for historical accuracy, but is a reflection on the Eliza of the Broadway show which is, if not re-imagined history, then at least restructured, re-focused, re-told. Which narrative? Naturally, the narrative we all think of is that of Hamilton – and Hamilton, in relation to the beginnings of the United States. Hamilton’s narrative, the show posits, has been the weakest of the Founding Fathers. He died at a time of relative infamy, the youngest Founding Father to have been and to have died. His political opponents came to power after his death, and thus they – Jefferson, Madison – are bigger household names (at his alma mater, The College of William and Mary, Jefferson is lovingly referred to as T.J. by teenagers). Where Alexander Hamilton’s desire for a legacy (empty in the end: “What is a legacy? It’s planting seeds in a garden you never get to see”) drives him to create his own narrative in symbiosis with that of the new nation, Eliza starts by aspiring to allowed to play some part in the greater story (perhaps somewhat in contrast to her outspoken sister’s response to the Declaration of Independence: ” ‘We hold these truths to be self-evident / That all men are created equal’ / And when I meet Thomas Jefferson / I’m’a compel him to include women in the sequel”). Whether she hopes for a part in Hamilton’s narrative, or in that of the founding of the United States, like her sister, never quite becomes clear. “I’m erasing myself from the narrative. how Eliza reacted when you broke her heart. You have torn it all apart. I am watching it burn. The world has no place in our bed. They don’t get to know what I said. As Leslie Knope – to mix my pop culture references – would say: “Eliza, you beautiful rule-breaking moth!” This final part of the song implies that Eliza, on some level, knew that Hamilton did not mean harm, did not mean for anyone to get hurt, and perhaps had good intentions overall (the letters being that which might have redeemed him). She had, however, no choice in the matter whatsoever, and the only choice left to her (other than divorce) is to take away a large part of Hamilton’s personal narrative from the greater story by burning the letters. It also protects her and her feelings at the time, though of course it opens up much more possibility for speculation. They are going through the unimaginable. Through heartbreak and tragedy, Eliza has come out as an active participant in all narratives, Hamilton’s and her own. But what of his legacy? Who tells your story? Eliza. In his death scene, Hamilton appears to give up on his ambition of leaving a legacy, as evidenced by the earlier quoted “what is a legacy? It’s planting seeds in a garden you never get to see.” Eliza, however, did get to see that garden – and did not like what she saw. In the finale, the ensemble – including Hamilton’s killer Burr – wonder “when you’re gone, who remembers your name? Who keeps your flame? Who tells your story?” The answer comes swiftly, softly, angelically: Eliza. Eliza’s agency is now complete: “I put myself back in the narrative.” The song touches on some of the things Eliza, at times with Angelica, did to keep Hamilton’s memory and legacy alive: interview soldiers who served with him, make sense of the writings he left behind, raise funds for the Washington Monument, found the first private orphanage in New York City, but also do things that were in his spirit, like speak out against slavery. By working to create, support and maintain the story of Hamilton for fifty years after his death, she not only safeguarded the legacy he sought, but she became the narrative. The story of Hamilton and Eliza are inextricably linked – one could not exist without the other. Is this history re-structured, re-focused, re-told? In the end, this show reminds us, there’s no such thing as history. What we are left with in the end is narrative. We are reminded we have no control over who tells this story, which seems in some opposition to Orwell’s “history is written by the winners.” Hamilton, after all, was one of the winners and another big winner – Washington – brings up our powerlessness over the narrative early on. 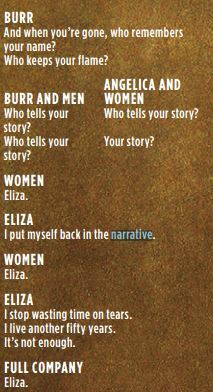 Eliza, however, appears to have conquered the men’s apparent inability to control the narrative. Through love, faith, and hard work, she ensured Hamilton was not forgotten and, through this, became the mother of this fantastic show. Gawd damn, this is a wonderful, insightful, intelligent assessment of a song I love so much within a play I love so much. Thank you!